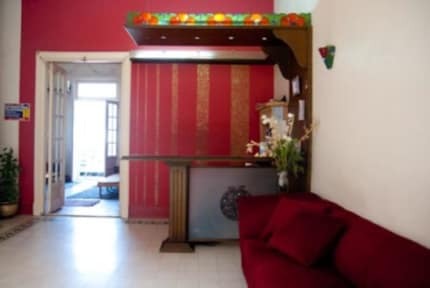 This well-positioned hostel is relaxed and easy-going, with a great atmosphere and friendly staff that make you feel at home. From the moment you walk into the lobby you sense the laid-back, welcoming vibe of MERAMEES hostel Little touches like fresh flowers, books, CDs and casual sofas in the lobby help make it feel like you're dropping by to see friends at home rather than checking into a hotel. The casual majlis (meeting room) off the lobby where breakfast is served makes a good place to hang out after a hot day's sightseeing. The rooms themselves have high ceilings, wooden floorboards, large windows and French doors leading onto balconies, and there are shared bathrooms and rooms with own bathrooms and toilets apart from the dorm room. Helpful stuff gives his guests plenty of advice about visiting Cairo and other parts of Egypt . The Meramees is certainly one of the more friendly options around down town. airport pick up service ( please check with us throw the email about the condition ). The hostel is very nice. Met some great people. Nice common area and great fun and helpful staff. Would definitely come back here. The location of the hostel is great and the staff is extremely helpful and friendly... Good breakfast! It used to be so good. I use to come several times to this hostel and stayed here for long periods. I saw it become better with time such as the breakfest. But since I saw they proactively share my details and all the know about me with the police (which is innocent, but still it's about the principal) I can't simply trust them anymore. The secret police came several times to check me and asked me tons of questions. Although nothing happened in the end it ruined my time there.